Artykuł zawiera opis dwóch przypadków chorych z rozpoznaniem bardzo rzadko występujących nowotworów z blastycznych plazmacytoidalnych komórek dendrytycznych (blastic plasmacytoid dendritic cell neoplasms – BPDCN). BPDCN charakteryzują się koekspresją antygenów CD4 i CD56 przy braku ekspresji innych mieloidalnych lub limfoidalnych markerów liniowych, pierwotnym zajęciem skóry i wtórnym szpiku kostnego oraz agresywnym przebiegiem klinicznym. Rokowanie jest złe, szczególnie w przypadku leczenia konwencjonalną chemioterapią. Zgodnie z opublikowanymi danymi jedyną opcją terapeutyczną, która wydaje się poprawiać rokowanie w BPDCN jest intensywna chemioterapia skojarzona z allogenicznym przeszczepieniem macierzystych komórek hematopoetycznych. In this paper we report two cases of very rare blastic plasmacytoid dendritic cell neoplasms (BPDCN). BPDCN are characterized by co-expression of CD4 and CD56 antigens in the absence of any specific myeloid or lymphoid lineage or markers, primary skin infiltrations followed by bone marrow involvement, and aggressive clinical course. The prognosis is poor, especially when treatment is based on conventional chemotherapy. According to published evidence the only treatment with some potential to improve BPDCN outcome is intensive chemotherapy consolidated by allogeneic hematopoietic stem cell transplantation. Słowa kluczowe: nowotwór z blastycznych plazmacytoidalnych komórek dendrytycznych, zaburzenia cytogenetyczne, chemioterapia. Key words: blasticplasmacytoid dendritic cell neoplasm, cytogenetic aberrations, chemotherapy. A category of rare and aggressive haematologic tumors co-expressing CD4 and CD56 antigens in the absence of any specific myeloid, B-, T-lymphoid or natural killer (NK) lineage markers is classified as blastic plasmacytoid dendritic cell neoplasms (BPDCN) according to the most recent 2008 WHO classification of tumours of haematopoietic and lymphoid tissues (1). This is in line with the recent knowledge that BPDCN are derived from the precursors of plasmacytoid dentritic cells (2-4). However, in the past a number of different terms were used for BPDCN due to their uncommon immunophenotypic, histopathological and clinical features, including blastic NK leukemia/lymphoma, histiocytic lymphoma or histiocytic associated hematologic malignancy, cutaneous a granular CD4+ CD56+ hematodermic neoplasm and NK-cell lymphoma or myelo-monocytic precursor – related lymphoma (5-12). BPDCN are diagnosed about three times more often among men than women, mainly in the elderly (median age at diagnosis at 7th decade of live) (5, 10). Till present the etiology of BPDCN has not been elucidated. Epstein Barr virus and HIV had been previously supposed to play a role in BPDCN pathogenesis, but later reports did not confirm their correlation to the disease development (5-12). Clinically, the typical initial presentation of BPDCN is presence of asymptomatic cutaneous lesions that are subsequently followed by bone marrow involvement and leukemic dissemination (5, 10). The disease is characterized by highly aggressive clinical course. Although BPDCN respond to different types of chemotherapy, the responses are usually of short duration, and disease is most often fatal within a few years from diagnosis (5, 10). Despite rare incidence of BPDCN, numerous variations from typical clinicopathological picture of BPDCN have been reported, such as different extracutaneous manifestation, lack of skin involvement, immunophenotypic variants or other, making a diagnosis even more complicated (13-17). In this paper we report two cases of BPDCN diagnosed in our center with objective to increase clinical awareness for these rare and aggressive malignancies that seem to be underdiagnosed in Poland. 63-year old man was referred to the Department of Chemotherapy of Medical University of Łódź in April 2008 for evaluation of potentially malignant skin lesions. The history of B symptoms was negative. On examination, the skin lesions were found to be predominantly purpuric nodules, in association with bruise-like areas, and were distributed over the left forearm. The majority of the nodules ranged from 1 to 2 cm in diameter. The nodules were not painful on palpation and the temperature of the adjacent skin was normal. On the physical examination lymphadenopathy, hepatomegaly or splenomagaly were excluded. The computed tomography scan of the chest and abdomen revealed no enlarged lymph nodes in the mediastinum or retroperitoneum. The complete blood count (CBC) was normal. On the basis of histopathological and immunohistochemical examination of the full-layer skin biopsy the diagnosis of BPDCN was established (fig. 1A-D). The skin was shown to be involved by dense, diffuse infiltration of blastic cells with irregular nuclei and one to a few nucleoli (fig. 1D). Fig. 1. The histopathological features of blastic plasmacytoid dendritic cell neoplasm infiltrating the skin in the case 1 (A, C) and case 2 (B, D). The infiltrates are dense and diffuse, save the epidermis (A) but deeply invade the adipose tissue (B and C). The blastic cells are medium-sized with variable shape of nuclei and various number of nucleoli; the mitotic figures are seen (D). The epidermis was intact, while the infiltration was extended to subcutaneous fat (fig. 1 A, B, C). The variable number of mitoses was seen (fig. 1D). Immunohistochemical profile was determined as positive for LCA, CD4, CD43 and CD56, and negative for such lineage markers as CD3, CD8, CD20, CD30, myeloperoxidase (MPO) and terminal deoxynucleotidyltransferase (TdT) andgranzyme B. For differential diagnosis with other small blue round cell tumors staining with other markers were also performed, namely CD99 (-), CKMNF (-), CK20 (-), HMB45 (-), NSE-, TTF1 (-), CKAE1/AE3 (-), Melan A (-), Vimentin (+), and synaptophysin (-). Proliferative index of Ki -67 (MIB-1) reached 80%. Additionally, bone marrow aspiration was performed to exclude bone marrow involvement by BPDCN and shown normal marrow cytology. The treatment was based on standard chemotherapy protocol CHOP (cyclophosphamide, doxorubicine, vincristine and prednisone) protocol. The patient received seven CHOP cycles at 4-week intervals and achieved complete resolution of skin infiltrations. In September 2008 the patient was referred to our center (Department of Hematology of Medical University of Łódź) due to suspicion of tumor relapse. Clinical examination disclosed reappearance of bluish-red nodular changes (diameter of 1 cm) on the left forearm and painful bulky lymph nodes in the right inguinal region (maximal dimensions of 10 and 6 cm). The history of B symptoms was negative. The liver and spleen were not palpable. CBC revealed mild anemia with hemoglobin concentration of 11 g/dl and normal white blood cells (WBC 4.11 x 10^3/ul) and platelets counts (PLT 234 x 10^3/ul). Skin lesion biopsy was performed and the histological and immunohistochemical examinations confirmed relapse of BPDCN. Immunophenotypig of tumor cells sampled through inguinal lymph node biopsy showed positive CD4, CD56, CD123 and BDCA-2 antigens with negative CD34 antigen and myeloid or lymphoid lineage specific antigens reflecting infiltration by BPDCN. Moreover, cells taken through inguinal lymph node biopsy were analyzed for cytogenetic abnormalities using 24-hours unstimulated culture and G-banding technique and karyotype was described according to the International System for Human Cytogenetic Nomenclature (18). This analysis revealed multiple cytogenetic aberrations with karyotype description as follows: 48-50, XY, +der(8)t(1;8)(q21;p11), del(10)(q2?2),+1~3mar[cp10]/46,XY. The aspirated bone marrow sample was normocellular with 33% erythroid precursors, 53% leucocytic precursors, 9.5% lymphocytes, 1.5% plasmocytes, 0.5% megakaryocytes and 1.5% monocytes. No atypical cells were found in the bone marrow during cytological inspection. The examination of cerebrospinal fluid did not reveal any abnormalities. Since rapid disease recurrence was seen despite previously administered lymphoma-type chemotherapy, the treatment strategy was changed to intensive chemotherapy used in acute myelogenous leukemia (AML). An induction regimen DAC-7 (daunorubicin, cytarabine, and cladribine) was administered without post-chemotherapy complications (19). Additionally, methotrexate, cytarabineand dexamethasone were delivered intrathecally as prophylaxis of central nervous system (CNS) involvement. However, only temporary partial response was achieved with partial resolution of skin infiltrations and reduction of the size of the inguinal lymph nodes to 3 cm. In October 2008 the patient was admitted to the Department of Hematology with the symptoms of disease progression including appearance of new skin infiltrations on the scalp (diameter of 1,5-2 cm) and the enlargement of the right inguinal lymph nodes (maximal dimension 8 cm). The cerebrospinal fluid was normal with no atypical cells detected. Another line of chemotherapy based on CMC (cladribine, mitoxantrone and cyclophosphamide combination) regimen and intrathecal methotrexate, cytarabine and dexamethasone prophylaxis of CNS leukemic involvement was started (20). Three weeks later, in November 2008, the patient was readmitted to our center because of BPDCN progression with worsening of general condition. Physical examination revealed numerous skin nodules on the scalp and limbs as well as further enlargement of the inguinal lymph nodes (diameter of 10 cm). CBC revealed pancytopenia (WBC 2.44 x 10^3/ul, Hgb 8.1 g/dl, PLT 12 x 10^3/ul) suggesting bone marrow involvement. However, the aspirated bone marrow was hypoplastic and trephine biopsy was not performed due to poor performance status of the patient. The initially administered treatment included combination of intravenous high-dose dexamethasone with low-dose methotrexate administered orally, and subsequently the patient was qualified to local palliative radiotherapy. However, the patient did not respond to the treatment and died in December 2008 due to disease progression. A 82 year-old man was referred to our center in December 2011 because of abnormalities in the peripheral blood counts (leucopenia and anemia) and skin lesions. The asymptomatic skin infiltrations were first observed by the patients three weeks earlier. The patient complained of general weakness and dyspnea on physical exertion, but did not present any other specific symptoms. Additionally, he gave a history of chronic cardiac insufficiency, hypertension and stable coronary disease. Physical examination on admission revealed multiple skin infiltrations located mainly in the abdomen area, shoulders and the upper and lower extremities. Skin lesions measured from one to three cm in diameter, were red color plaques and were not painful on palpation. Liver, spleen and lymph nodes were not enlarged on physical examination. An ultrasound of abdomen was normal. CBC revealed leucopenia with severe neutropenia (WBC of 1.55 G/L with 23% of neutrophils), significant anemia (RBC 2.88 x 103 G/L, Hb 8.2 g/dl) and normal platelets (PLT 147 G/L). There were no atypical cells identified on the blood film. Liver enzyme tests were normal. To explain the cause of cytopenias bone marrow aspiration was performed. Examination of aspirate showed normal cellularity with increased amount of collagen and reticulin fibers, however, no atypical cells were seen. Histopathohological and immunohistochemical examination of the material from skin biopsy revealed features typical for diagnosis of BPDCN. There was infiltration of dermis with immature blasts with irregular nuclei and one to a few nucleoli showing positive staining with LCA, CD4 and CD56. The neoplastic cells were negative for CD3, CD8, CD20 and CD30 and TdT. In this case we also observed some subset of MPO positive cells (fig. 2B). Ki67 (MIB-1) was positive in 50-60% cells. The variable number of mitoses was seen (fig. 2A, B), and there was a high number of apoptotic bodies. Fig. 2. Immunohistochemical features of blasticplasmacytoid dendritic cell neoplasm. The tumor cells are strongly positive for CD56 antigen (Dako Denmark) (x 100) (A). In case 2 MPO (Dako Denmark) is also positive in part of cells (x 100) (B). During first weeks of observation before treatment was introduced, the patient required several red blood cells transfusions, however, a spontaneous normalization of peripheral blood counts was subsequently observed. Due to advanced age and high risk of complications the patient was excluded from chemotherapy. The treatment was based on palliative long-term corticosteroid therapy with oral prednisone (20 mg daily). At the time of this report preparation (third month of therapy) the patient has remained stable with good general condition and normal peripheral blood counts, but no improvement of skin infiltrations has been observed. Based on published case series and individual case reports BPDCN annual incidence is estimated at about 0.7% of all skin primary malignant lymphomas (1, 5, 10). In our large academic center only three patients were diagnosed with BPDCN during last decade including two rather typical cases described here and one very unusual leukemic variant without skin involvement that will be reported elsewhere (manuscript in preparation). It is therefore likely that some cases of BPDCN remain undiagnosed. This may be due to the fact that proper diagnosis of BPDCN requires complex and extensive immunohistochemical or/and genetic investigations in order to exclude other tumors, especially those that may express CD56 with or without concomitant CD4 expression, such as AML, extranodal T/NK lymphomas, nasal type, and mature T-cell lymphomas (1). The diagnosis is further complicated by the fact that numerous variations from the typical clinicopathological picture of BPDCN have been described (13-17). Furthermore, BPDCN often initially present as asymptomatic cutaneous nodules in very elderly patients that may delay referral to specialized hematology centers. Both reported in this paper cases were elderly males that corresponds to the most commonly affected by BPDCN subset of population. However, BPDCN may occur at any age including children (5, 10). The initial clinical presentation of disease was typical with infiltration of the skin and subsequent involvement of the hematopoietic system, including bone marrow and lymph nodes. In our cases the diagnosis was established based on histopathological and immunophenotyping of tumour cells samples through full-layer skin biopsy. Generally, typical for BPDCN immunohistochemistry results were seen including positive CD4,CD56 antigens and negative lineage markers, but in one of patients MPO was positive in a proportion of cells. Such co-expression of myeloid markers was reported by others (13). Interestingly, one of our patients had complex karyotype aberrations. Also other authors reported complex chromosomal abnormalities in BPDCN, but no characteristic anomaly was identified (5-10). Regarding treatment strategy, currently there is no standard therapy recommended for this rare group of neoplasms. One of our patients, who had not had significant contraindications to chemotherapy received four different lines of lymphoma-type and AML-type chemotherapy, but achieved responses were of very short duration and did not stop disease progression. The second patient was treated on palliative basis with corticosteroids. Poor efficacy of conventional chemotherapy observed in our patient is in line with published evidence showing that it may give temporary resolution of symptoms, but is not curative. Based on reported data, it seems that only early intensive chemotherapy, aggressive prevention of CNS infiltration, and prompt allogeneic hematopoietic stem-cell transplantation may improve prognosis of patients with BPDCN (5, 10). It must be, however, underlined that such approach is rarely feasible in the context of typically advanced age of patients with this diagnosis. Nevertheless, the chance of post-transplantation relapse is much higher than with other malignant lymphomas, and more effective therapeutic strategies are needed. In conclusion, we report two cases of very rare BPDCN that are very aggressive hematologic tumors characterized by co-expression of CD4 and CD56 antigens with absence of lineage markers and skin and bone marrow involvement. The prognosis on conventional chemotherapy is very poor, and the only treatment with potential to improve BPDCN outcome is intensive chemotherapy consolidated by allogeneic hematopoietic stem cell transplantation. 1. Swerdlow SH, Campo E, Harris NL et al. : WHO classification of tumours of haematopoietic and lymphoid tissues, Fourth Edition. 2008. 2. Petrella T, Comeau MR, Maynadié M et al. : ‘Agranular CD4+ CD56+ hematodermic neoplasm’ (blastic NK-cell lymphoma) originates from a population of CD56+ precursor cells related to plasmacytoid monocytes. Am J Surg Pathol 2002; 26: 852-862. 3. Jaye DL, Geigerman CM, Herling M et al. : Jones D. Expression of the plasmacytoid dendritic cell marker BDCA-2 supports a spectrum of maturation among CD4+ CD56+ hematodermic neoplasms. Mod Pathol 2006; 19: 1555-1562. 4. Urosevic M, Conrad C, Kamarashev J et al. : CD4+CD56+ hematodermic neoplasms bear a plasmacytoid dendritic cell phenotype. Hum Pathol 2005; 36: 1020-1024. 5. Jacob MC, Chaperot L, Mossuz P et al. : CD4+ CD56+ lineage negative malignancies: a new entity developed from malignant early plasmacytoid dendritic cells. Haematologica 2003; 88 (8): 941-955. 6. Herling M, Jones D: CD4+/CD56+ hematodermic tumor: the features of an evolving entity and its relationship to dendritic cells. Am J Clin Pathol 2007; 127: 687-700. 7. Kameoka J, Ichinohasama R, Tanaka M et al. 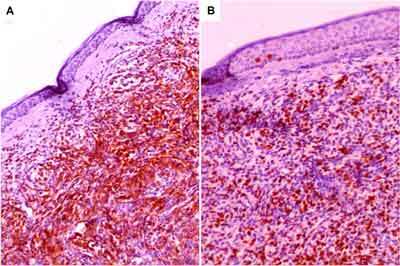 : A cutaneous agranular CD2- CD4+ CD56+ „lymphoma”: report of two cases and review of the literature. Am J Clin Pathol 1998; 110: 478-488. 8. Ascani S, Massone C, Ferrara G et al. : CD4-negative variant of CD4+/CD56+ hematodermic neoplasm: description of three cases. J Cutan Pathol 2008; 35: 911-915. 9. Weaver J, Hsi ED: CD4+/CD56+ hematodermic neoplasm (blastic NK-cell lymphoma). J Cutan Pathol 2008; 35: 975-977. 10. Cota C, Vale E, Viana I et al. : Cutaneous manifestations of blasticplasmacytoid dendritic cell neoplasm-morphologic and phenotypic variability in a series of 33 patients. Am J Surg Pathol 2010; 34: 75-87. 11. Pilichowska ME, Fleming MD, Pinkus JL, Pinkus GS: CD4+/CD56+ hematodermic neoplasm („blastic natural killer cell lymphoma”): neoplastic cells express the immature dendritic cell marker BDCA-2 and produce interferon. Am J Clin Pathol 2007; 128: 445-453. 12. Piña-Oviedo S, Herrera-Medina H, Coronado H et al. : CD4+/CD56+ hematodermic neoplasm: presentation of 2 cases and review of the concept of an uncommon tumor originated in plasmacytoid dendritic cells expressing CD123 (IL-3 receptor alpha). Appl Immunohistochem Mol Morphol 2007; 15: 481-486. 13. Shiman M, Marchione R, Ricotti C et al. : CD4+/CD56+ Hematodermic neoplasm (plasmacytoid dendritic cell tumor). Dermatol Online J 2008; 15: 5. 14. Giagounidis AA, Heinsch M, Haase S, Aul C: Early plasmacytoid dendritic cell leukemia/lymphoma coexpressing myeloid antigenes. Ann Hematol 2004; 83: 716-721. 15. Li Y, Li Z, Lin HL et al. : Primary cutaneous blasticplasmacytoid dendritic cell neoplasm without extracutaneous manifestation: case report and review of the literature. Pathol Res Pract 2011; 207: 55-59. 16. Rauh MJ, Rahman F, Good D et al. 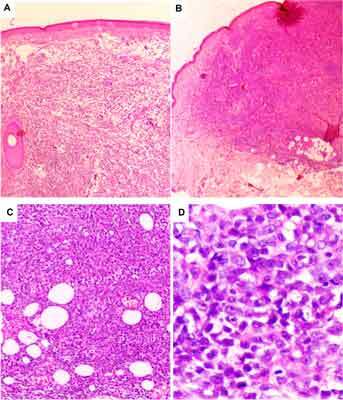 : Blasticplasmacytoid dendritic cell neoplasm with leukemic presentation, lacking cutaneous involvement: Case series and literature review. Leuk Res 2012; 36: 81-86. 17. Stetsenko GY, McFarlane R, Kalus A et al. : CD4+/CD56+ hematodermic neoplasm: report of a rare variant with a T-cell receptor gene rearrangement. J Cutan Pathol 2008; 35: 579-584. 18. Patel JL, Shetty S, Salama ME: An unusual case of cutaneous blasticplasmacytoid dendritic cell neoplasm with concomitant B-cell lymphoproliferative disorder. Am J Dermatopathol 2011; 33: 31-36. 19. Shaffer LG, Slovak ML, Campbell LJ: ISCN 2009: An International System for Human Cytogenetic Nomenclature (2009). Basel: S. Karger; 2009. 20. Holowiecki J, Grosicki S, Robak T et al. : Polish Adult Leukemia Group (PALG). Addition of cladribine to daunorubicin and cytarabine increases complete remission rate after a single course of induction treatment in acute myeloid leukemia. Multicenter, phase III study. Leukemia 2004; 18: 989-997. 21. Robak T, Blonski JZ, Gora-Tybor J et al. : Polish Leukemia Group (PALG CLL2). Cladribine alone and in combination with cyclophosphamide or cyclophosphamide plus mitoxantrone in the treatment of progressive chronic lymphocytic leukemia: report of a prospective, multicenter, randomized trial of the Polish Adult Leukemia Group (PALG CLL2). Blood 2006; 108: 473-479.